Like other Aumsville city officials, Hofmann avidly backs the city’s summer reading program with dedication and a lot of volunteer hours. The reading program is a part of Aumsville’s Summer Recreation Program, which just ended its third year. According to Hills, the reading program really took off the second summer when Cascade School District shared with the city $1,000 of grant money it had received for the city to buy books to give away during events. The city will continue to seek funding and volunteers for future summer recreation programs, Hills said. “It has been a great success that I am certain will have long-lasting benefits in the many lives that have been touched by it!” she added. 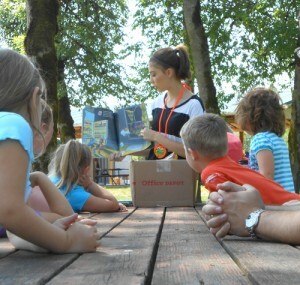 Children are given a book every week during the 10 summer day camp sessions, organized by Hofmann, city councilor and Parks and Recreation Committee program director Lorie Walters, and Julie Wisser, assistant vice president and branch manager at Riverview Community Bank. According to Walters, the young readers logged in well over 1,000 hours this summer. The program has become such a success that ideas are floating around to expand the program to twice weekly during the summer and monthly Saturdays, if volunteers and funds are available. To further expand youth opportunities, officials are looking to bring a Boys & Girls Club to Aumsville. “It’s about investing in what counts: happy, healthy, educated kids,” Hofmann said. We loved the camp and summer reading program! It really beefed up our home library. When we found Frog and Toad in the box of books we read it every day for about 2 weeks afterwards. My children had a lot of fun and as a parent I appreciate all the hard work of the volunteers and the emphasis on reading.